Released in 1998, Dirty Work is a critically panned buddy comedy that follows Mitch (Norm Macdonald) and Sam (Artie Lange) as they try to get enough money to save Sam’s dad. Unable to keep any jobs, they resort to their one talent: screwing people over. They set up a revenge-for-hire business where anyone can hire them to screw someone over. After a couple stunts, the duo is hired by the corrupt real estate mogul, Travis Cole, who sets them up. While the story is completely predictable, it is the humour that ascends this film above the typical modern comedy. The physical gags in the film lie in contrast between Mitch’s cartoon-like behaviors and a realistic world. As for the non-physical jokes, anyone who’s ever seen a Norm Macdonald performance will immediately recognize his dry delivery style. Every joke he makes is made in a completely casual tone that allows the viewer to appreciate the punch line without wondering where the laugh track is. Norm Macdonald’s role dominates the film to the point the entire movie could be seen as a mere excuse for him to introduce his material into a long form skit. 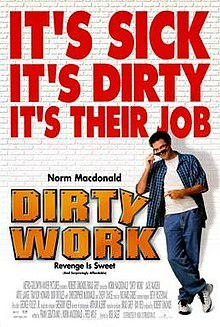 As the unsung masterpiece of the comedy genre, Dirty Work is a must-see for every audience, especially fans of either Norm’s stand-up or his shows.